Kids are 2 months already getting all of mom's milk - is it too late for me to start milking? 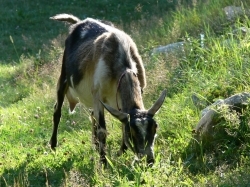 Discussion in 'Birthing, Weaning, and Raising Young Goats' started by MarinR, May 25, 2014. Brand new to goats. My first doe has had her first freshening - 3 beautiful doelings - just a little more than two months ago. I tried to get into a milking routine about one month ago, but things got a little crazy at work and I decided to give her kids a little more time. The experience was stressful as well, with the kids screaming and the doe stuggling to get back to them.... Things are slowing down at work finally and I'd like to try again soon. The kids are strong and healty and eating hay and grains like the big girls. How much longer will my doe produce milk for them, and is it too late for me to get into a once a day milking routine? These are Nigerians and more pets than anything. I'm taking this first experience for what it is... making newbie mistakes and learning from them so I can have a successful dairy herd in the future. Any advice, tips, encouragement is welcomed. Thanks! It is absolutely NOT too late! I milk once a day and have two does that I've been milking for over a year. A lot of folks will lock the babies away from the doe over night and milk in the mornings. I find my schedule allows for easier milking in the afternoon/evenings. Do what works for you and enjoy! I just lock the kids up at night and then milk in the morning. As long as the kids are taking the milk she will keep making it, at some point she will wean them that's when you need to be milking her to keep the milk flowing. Absolutely you can milk. 2-3 months is when a doe is peak lactation. That's what I did. I would put the does in a separate pen for the day. I would milk after work and then let everyone back together. Eventually the babies were weaned and/or sold and that makes it a lot easier. I still only milked once a day and it worked out well for me.